The gold jewels from Rachel Art Jewelry, designed by Rachel Eshkol, are made from 14k, 18k, and 22k gold, and set with precious stones, pearls and diamonds. All raw materials are of the highest standard, offering market-leading levels of quality. 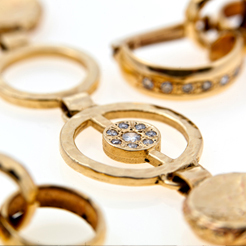 Rachel Art Jewelry is characterized by clean, classic lines that enhance each jewel's look of luxury. The jewelry combines color, form and texture in a harmonious relationship between gemstone and gold, which acts as the stone's artistic frame. In a unique design process, gemstones are carefully chosen based on their coloration and character, polish and setting, while the finish of the gold involves unique techniques of material processing. All these elements are integrated into a unified whole of design, form and line to create each individual item of jewelry.